Provides complete disk cloning and disk imaging1 of hard disks and hardware RAID arrays. Resizes partitions during the cloning or image restoration process to make copies either larger or smaller than the original. Automatic Pre-image Verification ensures all data on source device is accessible before overwriting an existing backup. AccuClone™ technology ensures a perfect image whether running natively from within Windows or from the Casper Tech Edition customized boot environment. SmartClone™ technology dramatically reduces the time required to update a copy or re-image a disk. SmartWrite™ technology ensures maximum performance and full use of computer while cloning or imaging a hard disk. SmartResume™ technology provides support for safely resuming an interrupted backup to another disk or image file1. Supports all drives including SAS, SATA, eSATA, SCSI, ATA/IDE, USB, Firewire, and hardware RAID arrays. Automatic detection and support of solid state (SSD) and Advanced Format Drives ensures optimal performance. Automatically converts drives from FAT16 to FAT32 or from FAT to NTFS during cloning and image restoration when necessary. Dynamic Volume support allows dynamic volumes to be copied to other Dynamic Volumes or Basic Disks. Seamlessly copies multi-boot Windows configurations3. Easy-to-use wizards for copying, creating, and removing drives, as well as creating and restoring complete disk image backups. SmartStart™ greatly simplifies the process of replacing an existing Windows system disk with a new disk. SmartRelease™ automatically prepares a portable drive for safe removal after a copy has been completed. SmartAlert™ Notifications notify you via email when the a copy has been completed. Advanced Power Management support automatically suspends, hibernates, or powers-off the computer after a copy. Runtime controls allow you to quickly change power management and notification options after the copy is underway. Creates a fully bootable clone of a Windows system drive that can boot and run directly from an external USB drive2. Allows you to perform advanced disk management tasks, including create and remove partitions, change the active partition, change a drive letter assignment, replace damaged or missing boot records, and more. Customizable startup environment created on a USB flash drive or CD/DVD provides options to add additional storage and network drivers, custom drivers, custom network settings, and more. Compatible with virtually all 32-bit and 64-bit versions of Windows and Windows Server, including older versions such as Windows 9x/ME4. 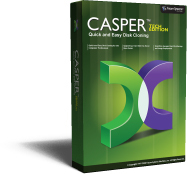 Virtual disk image file backups are supported only when running on Windows 7 and later or when booting and running from the Casper Tech Edition Startup Disk. The VHDX image file format is supported only when running on Windows 8 and later or when booting and running from a Casper Tech Edition Startup Disk created with the Windows 8.x ADK. Multi-boot configurations and Windows ME/9x systems supported only when booting and running from the Casper Tech Edition Startup Disk. Not designed for use with Windows NT or Windows Server for Itanium-Based Systems.